If a picture is worth a thousand words, how much is a GIF worth? The next content revolution is going to involve a GIF. At the confluence of a surge in video, short form content (snackability) and the sharing ecosystem, the GIF is ready to explode. Because now you can find them easily. So far, experts have been able to track GIF searches on open platforms like Tumblr and Twitter but have yet to extract data from messaging apps or work-management platforms like Slack. “We see a lot of marketing value in being part of those conversations in an organic way,” said Jared Goldsmith, VP of marketing and digital strategy at NBCUniversal. Giphy Inc., which in 2016 was valued at $600 million, is a central ecosystem of GIFs (or “assets” if we’re being formal) that can be deployed over and again. In January 2018, the GIF catalogue became searchable in Instagram Stories, a huge development that is sure to interest forward-thinking brands. Over the next few years, we will see Giphy collaborate more and more with publishers through ad products and measurement tools. NBC sees GIFs as a path to engagement. Users are seeking out and sharing their content from their favorite series with their friends leading to an uptick in viewership. The network can then analyze the most searched terms and GIFs and produce their next shows with those results in mind. 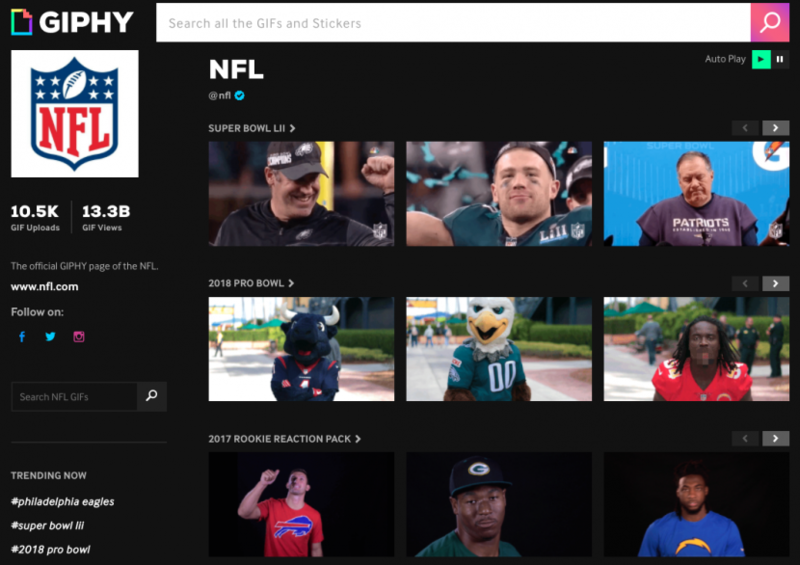 Additionally, the National Football League is all in on Giphy. They use it to promote their brand, events and everything else. In other words, they use it to “continue the conversation” around the brand. Beyond GIFs, we’ll start seeing personalized videos. Companies like AdGreetz and SundaySky are both using democratized data—demographic, social, purchase, viewing— to create user-based videos for brands. Idomoo, a personalized video platform, created custom videos for Cadbury using Facebook data earning a 65% click-through rate and a 33.6% conversion rate. Cisco estimates that videos will account for 82% of all Internet traffic by 2021. The ultimate “win” in content marketing is getting your audience to spread your message for you. That’s why we want to create shareable content. A good library of GIFs, tagged properly, is shareable content waiting to happen, especially on mobile, because GIFs aren’t heavy and don’t bust data plans. GIFs are truly the gift that keeps on giffing.